In 1811, a young lawyer and journalist named Henry Brackenridge found the ruins of an ancient city near St. Louis. As archaeologist Timothy Pauketat has written, Brackenridge was standing on the site of what was once the Grand Plaza of Cahokia, a city inhabited in 1250 by some ten to twenty thousand Native Americans. Brackenridge believed he’d made a great discovery. He did not see ancient stone walls or worn foundations. Instead he marveled at the pattern of raised earth that resembled an urban grid, human bones, and mounds of soil formed into dozens of grassy pyramids up to 100 feet tall. But the world ignored Brackenridge’s discovery, and Americans have not treated what Dr. Pauketat calls “Ancient America’s great city on the Mississippi” with reverence. Four-lane roads and highways surround and bisect Cahokia, the sprawl of East St. Louis covers more of the ancient site, and many of the earthen pyramids have been scraped away to use as infill. Cahokia has since been dignified with a state park and visitors center, but it’s not well known outside of Illinois and Missouri. It hardly attracts the number of visitors you’d expect for America’s version of the pyramids and the ruins of the country’s greatest, ancient city. 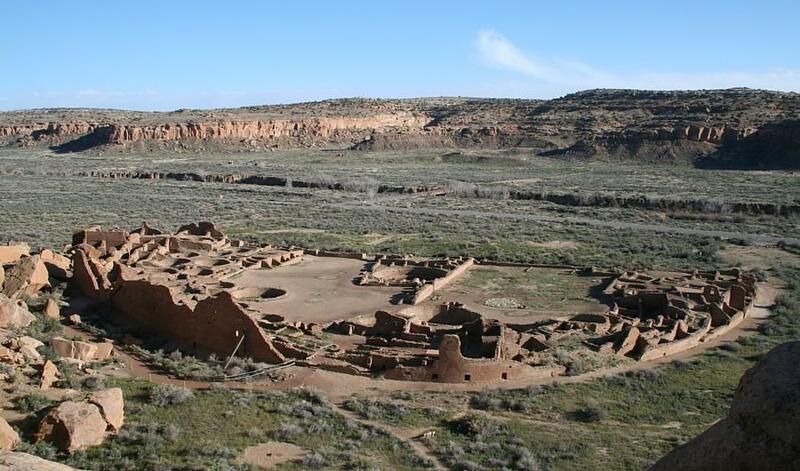 The same is true of impressive and important American Indian sites like the pueblos of Chaco Canyon, New Mexico, and the pre-historic earthworks of Poverty Point in Louisiana. Americans travel to Machu Picchu, Petra, Troy, and Angkor Wat. So why do so few visit America’s own ruins? The concept of tourists flocking to American Indian archeological sites may seem strange if you learned in school—like this author did—that America was sparsely inhabited wilderness before Europeans arrived. Through the 1950s, this was the consensus in academia. As journalist Charles C. Mann eloquently explains in 1491, a sweeping history of the Americas up to the arrival of Christopher Columbus, the most commonly cited estimate of North America’s population in 1491 was 1.15 million. That’s about the population of modern-day Rhode Island. Similarly, Mann notes that a French soldier exploring Cape Cod in 1605 decided that the area was too well settled to build a French base. And when Hernando de Soto pillaged his way through the American Southeast in 1539, his Spanish force regularly encountered thousands of Indian warriors and saw areas “very well peopled with large towns." The reason that Europeans could, decades later, settle unoccupied lands was that their predecessors had unleashed smallpox, bubonic plague, and the measles in the Americas. By living in close contact with domesticated animals like pigs and cows, residents of the Old World had incubated all sorts of diseases, which they then developed resistances to. The New World had few domesticated animals and no resistance to the dozens of diseases that appeared at once. When colonization began in earnest, European settlers found skeletons and abandoned villages. This is part of the common understanding of American history. (Although in the 1600s and 1700s, many Europeans looked at the deaths as divine providence rather than tragedy.) But in the 1960s and 1970s, revisionist historians argued that the death toll—and therefore America’s pre-Columbian population—had been severely underestimated. Some believed that up to 18 million people lived in North America in 1491; a more conservative figure was seven million. Once you add in revised estimates of the population of South America, the idea that Christopher Columbus “discovered” a “New World” appears even more absurd. “Perhaps one human being in five was a native of the Americas,” James Wilson writes in The Earth Shall Weep, which uses the seven million estimate for the population of North America. “In 1492, the western hemisphere was larger, richer and more populous than Europe." The racist and ideologically convenient views held by European colonists of Native Americans as small, simple groups of people influenced interpretations of North American history. When Americans did notice Cahokia’s ruins, most of them assumed that Indians could not have made them. They theorized that Vikings, Greeks, or Egyptians built the mounds; Thomas Jefferson advised Lewis and Clark to look for white, Welsh-speaking Indians who raised the pyramids. Even later archeologists struggled to imagine an Indian city. Dr. Timothy Pauketat, an archeologist who wrote a book about Cahokia, believes the city was home to over 10,000 people in 1250, with more Cahokians living on the surrounding farmland. If that’s the case, Cahokia was larger than London. Cahokia is mysterious to historians because North America did not have writing systems, and Cahokia’s population disappeared suddenly and mysteriously in the late 1300s. By the time Europeans found the site, even Native Americans knew little about it. What we do know is that a village was razed in 1050 to rebuild Cahokia on a grid, with a grand plaza and ceremonial structures built on two hundred huge, earthen pyramids. The population increased so rapidly—Dr. Pauketat writes that walking from the edge of Cahokia’s territory to the city center would have taken two days at its peak—that Cahokia must have drawn thousands of immigrants inspired by its religion, culture, or politics. That culture included human sacrifices, which took place when Cahokia’s leaders were buried on its pyramids. The idea that cruel leadership may have driven away Cahokia’s immigrants is one of many theories for its demise. We know what we know about Cahokia because Americans built a highway through it. The law that created the interstate highway system in the 1960s included funding to investigate archaeological sites that would be damaged, which meant scholars had funding and a mandate to study Cahokia. Discovering that the mounds were actually the remains of the greatest city in North American history didn’t stop the construction of the highway or the expansion of the suburbs, which destroyed many of the pyramids and left roads crossing and surrounding Cahokia. But what remained of Cahokia was already a state park, which UNESCO named a World Heritage Site in 1982, and the state built a visitors center dedicated to Cahokia’s history. Many St. Louis schoolchildren visit on field trips. Cahokia receives around 250,000 visitors per year, and tourists from Germany, France, and the U.K. sign the guest book. That makes Cahokia a modest attraction—over one million tourists visit the Incan ruins of Machu Picchu (despite quotas that limit the number of daily visitors), and 1.5 million tourists visit the Mosque-Cathedral of Cordoba, Spain, which was one of the world’s largest cities in Cahokia’s time. 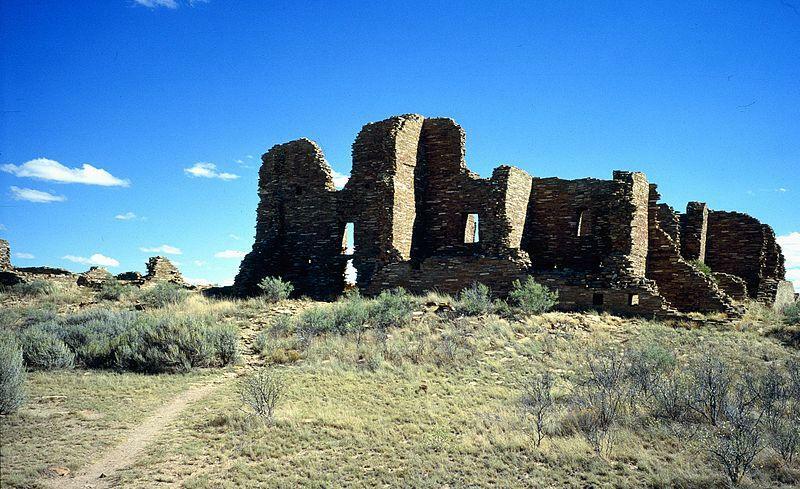 The ruins of pueblos built by ancestors of the Hopi and Pueblo people in Chaco Canyon, New Mexico, are stunning. But they draw only 40,000 tourists annually. (Chaco Canyon is not easily accessible.) 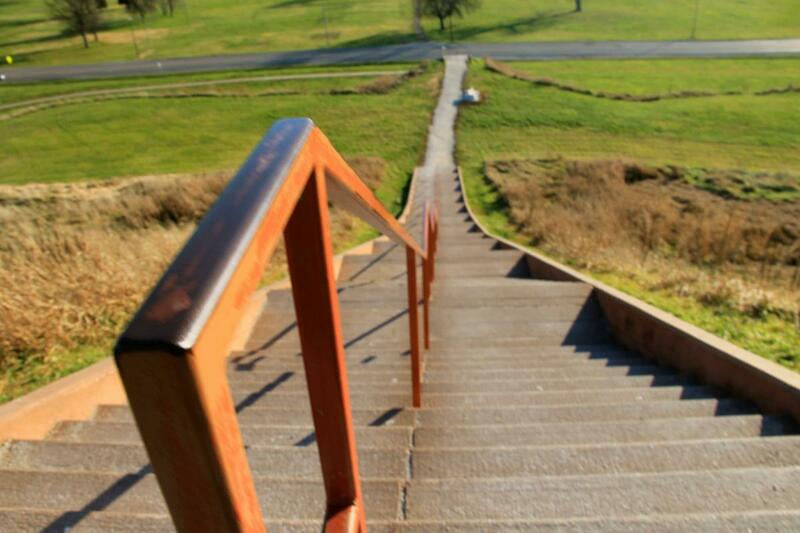 Like at Cahokia, the number of visitors has decreased in recent years. 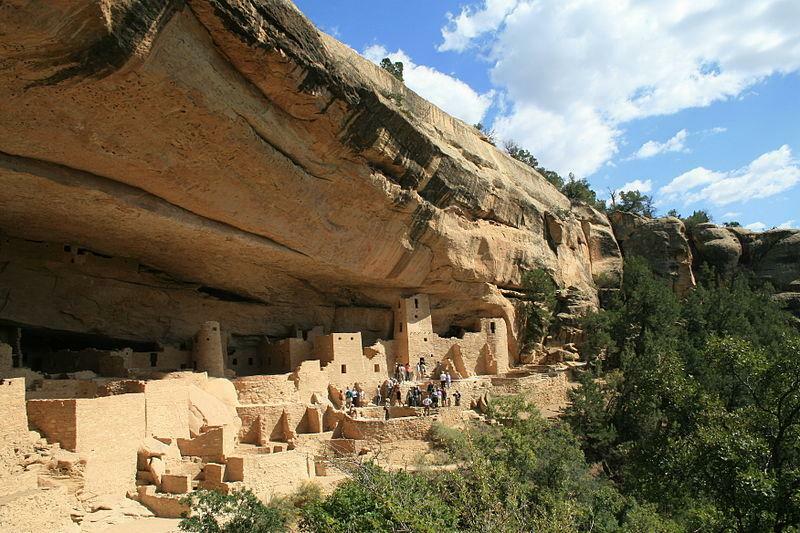 The exception to this trend of disappointing turnout is Mesa Verde National Park, which is home to the Cliff Palace and draws 550,000 annual visitors. The tourism industry is not a bastion of free-market principles. Instead governments are active participants who compete for tourists’ attention and wallets. Governments do market research and marketing. Governments build highways to remote destinations. Governments provide security and regulate tour operators. I just can't get past the four-lane gash that cuts through this historic site. Instead of imagining the thousands of people who once teemed on the grand plaza here, I keep returning to the fact that Cahokia Mounds in Illinois is one of only eight cultural World Heritage sites in the United States, and it's got a billboard for Joe's Carpet King smack in the middle of it. The Greek government loves to invest in the Parthenon, and Greeks love to visit it. But Indian sites are more likely to remind Americans of the Trail of Tears and treaty violations than appeal to their nationalism. Due to the economic conditions of the State of Illinois and the Illinois Historic Preservation Agency, no funding is available for public outreach, community events, and marketing. All of these activities are funded solely by the support group the Cahokia Mounds Museum Society. But even if Americans did invest in Native archeological sites and wanted to visit them, many American Indians might still feel wary about welcoming them. Camille Ferguson is the Executive Director of The American Indian Alaska Native Tourism Association (AIANTA). When we talk over the phone, she explains that many sites, unlike Cahokia or Chaco Canyon, are owned by tribes. And those tribes often lack the funding to build the infrastructure and provide the security a tourism attraction would need. This state tourism video shows some of the earthworks built between 1650 and 700 BC in Poverty Point, Louisiana. Theft is not the only concern; so is respect. Dr. Keene, for example, has several friends who portrayed American Indians at Plimoth Plantation, a “living museum” in Massachusetts that re-creates rural life in 17th century New England. "Visitors thought they weren't native because they didn't look like a Hollywood Indian," says Keene. "Or people asked them about the Washington football team. The public still leaves with the impression that natives were savage or uncivilized. These experiences are hard on native people." There are no residents of Stonehenge or the pyramids. But the relatively young ruins of North America are still homelands to many native peoples. This sentiment pervades The Inconvenient Indian, a book by Thomas King. In the same way that Ta-Nehisi Coates explains in Between the World and Me what it feels like to be a black man in America, King explains what it feels like to be an Indian in North America. And to be an Indian, King writes, is to feel like an inconvenience. Because Indians were “supposed to” die out. This is why Camille Ferguson, speaking on behalf of many American tribes, is happier talking about new cultural centers than ancient ruins, which cement the idea that Indians have died out. Sites like Cahokia and Chaco Canyon are underappreciated, but North America does have fewer ancient ruins than many parts of the world. But in North America, Cahokia was the lone great city. Why? According to Dr. George Milner, “you can find as many opinions [on that question] as archeologists.” The theory presented by Jared Diamond in Guns, Germs, and Steel, however, is that North America never developed the intensive agriculture to support permanent farms and dense cities. But judging the natives of North America by the number of large cities, ancient, stone towers, and permanent farms is making the same mistake as the early Europeans. Indians primary tool for reshaping their environment was fire. During the Civil War, American troops in Virginia’s woods could barely see each other through the dense underbrush. But when Europeans first arrived, they marveled that they could ride a horse straight through a forest. The difference was that Indians had once cleared out the underbrush with fires so large that the earliest colonists watched the burns like they were fireworks. This is the irony of Americans' indifference to the country’s archeological sites. By 1492, American Indians had created a giant park whose beauty and riches inspired thousands and thousands of Europeans to cross a continent. They just failed to realize what they were seeing. And now it’s gone. Our next article investigates the business of storing nuclear waste that will be lethal for the next 10,000 years. To get notified when we post it → join our email list. This article was updated on September 11, 2016. The original article said native actors at Sturbridge Village had faced disrespectful questions. But Dr. Keene actually referred to actors at Plimoth Plantation. We regret the error.